My, my… Has it been a month already? I should be more diligent in updating this blog. Afterall this is what serve as snippets of my roller coaster life (as if). So, it’s probably quite late to say but nonetheless, Happy New Year!!!! Looking back, I must say 2012 has been an amaaazing year. I am quite content with how I’ve turned out one year later. 2012, like what I’ve tweeted has taught me lessons, given me experiences that have impacted me greatly. Things that I never thought I would be capable of doing, I managed to accomplish. And that, with the grace of God, made me a stronger person. I am more aware of myself and my abilities at the turn of the year. Regardless of how things have turned out, a few disappointments, a few let-downs to people, a few pleasant surprises; it is always, always important to keep your chin up. My focus this year is mainly on health and overall wellbeing, that includes mental health. I find myself ageing mentally at a rapid pace, which is actually NOT GOOD! Physical health can directly contribute to your mental wellbeing believe it or not! So I’ve decided to list out a few of my bad vices, reviewing 2012 and think about the challenges and obstacles faced. Yes, many people might disagree with me on this, but an organised lifestyle is an organised mind, that is inevitably a stress free mind. By devoting a little of our time to getting rid of the clutter in our lives and maintaining things relatively clutter-free , we’ll reap the rewards of reduced stress and a more organised and productive existence. – Try it! 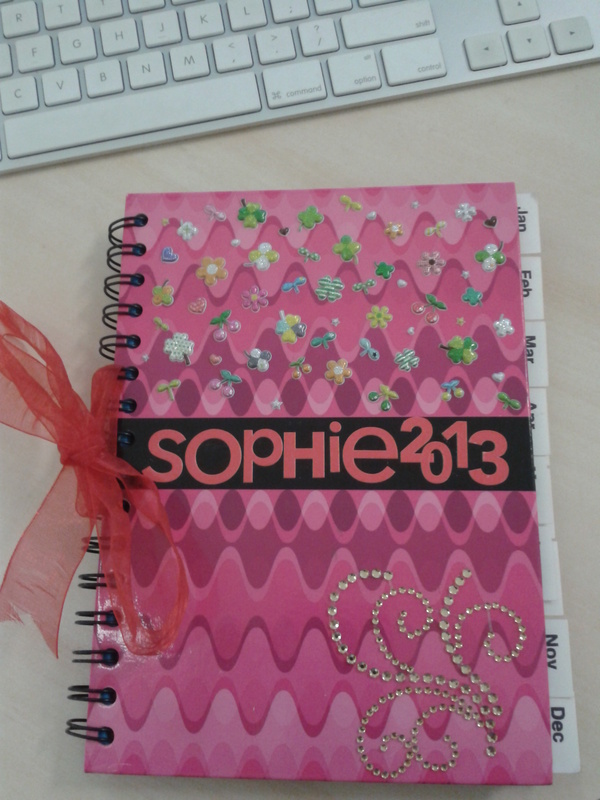 This was the result: A regular blank hard cover hotebook, turned into a personalised management diary. Neat eh? My idea is that; the more colourful the and attractive the book is, the more I will look at it and make use of it. So there, it’s yet another way for me to get organised – properly. And so far I’ve been doing a good job at it. I’m quite glad that I’m keeping up with something for once! Things that are happening in my life right now hasn’t really been a walk in the park, especially the relationship with the boyfriend. I must admit, it has taken a toll on me, and has consumed a lot of my energy just arguing for the most maddening and absurd reasons you can possibly think of. Given the nature of my personality, I am very certain about the fact that I am a very giving person, always have and probably always will be. Sometimes I don’t understand why I do, but something in me just tells me to anyway. Even if I would end up get brutally hurt in the end, and I end up hurting others because of my rash decisions and words which I know for sure, more than anything stems from my short-fused anger which is slowly coming back to me after a hiatus of what – 4 years? How it is triggered? I could say that my patience and my kindness have been tested for too long from far too many people, it could also be because I’m starting to be a somewhat of a perfectionist and my OCD is hitting my head intermittently. About 4 years ago, I was far worse than what I am today. I used to lose my patience too frequently, it was ugly. When I look back I remember moments when I used to scream at my ex boyfriends in public, kick and stomp around, swore relentlessly – I cringe. It was really ugly, and I really couldn’t believe I used to have that sort of temper. A part in me feels terrible now for what happened then. Is it karma that the reverse is happening right now? I won’t ever find the answer to that. Ever since the ex-boyfriend and I broke up, and I went off to Melbourne, I suddenly found myself properly single. I did a lot of soul searching. I started meditating a lot, I started to appreciate life a bit better. I learnt a lot about my hometown away from home for the first time. I met new people and I began to appreciate people from all walks of life. I could say that my experience in Melbourne has forced me to be an independent self-loving human being. Most of all, I reconciled myself with God and that helped me a great deal in having serenity in my life along with meditation. And that went well for me, I was doing well at the end of 2010, having a good time with my friends, and having a steady job. Things took a gradual turn in 2011, when I let that slip. I swear, this is just my testimony but if one forgets about God, God Himself will forget about them and they suddenly find themselves lost. Like I was, I still am but I hope it’s not too late now, to regain that steadfast composure that I used to have and make it a point to maintain it. Ok, the most difficult of all resolutions in my honest opinion. Keeping fit! I have to say I’ve put on a layer around my tummy which I really should lose. My ideal weight is 48kg. At the moment I’m 53.1kg (just weighed myself yesterday ^_^). Yes, haha. Bottomless pit I remember being called that once. But that was when I had a skyrocketing metabolism rate, that by the time I wake up the next day I would resume to having a fairly deflated tummy. But these past few months I’ve noticed the extra layer and the fact that my clothes seemed a little snug, alarmed me. But it’s not too late, to get into a regime. I have a target to run atleast 20 mins, 3 times a day or maybe twice and swim for one of those days. Hah, “working your arse off to make just enough money to be broke”. That’s how it’s always been. So this year, I’m going make it a point to start saving every month. Cut down on my spending such as cabs and useless desserts. And probably taking a part time job? 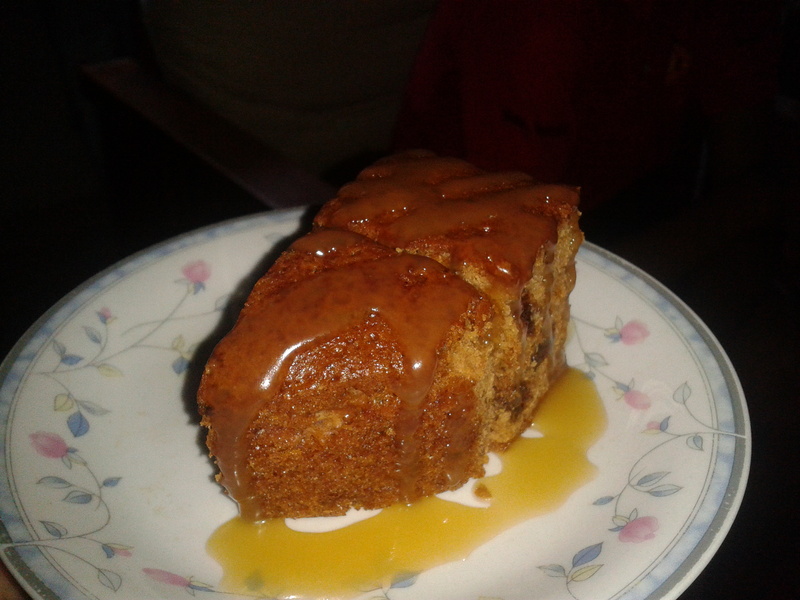 Yummy homemade Butterscotch Pudding Cake made by my uncle on New Year’s Day. So the list of 5 is what I have essentially for this year. It’s not easy no, but I’m glad there is a direction nonetheless. Will definitely update on the progress. Happy 2013!